La319 Le Vieux Bourg Pleherel pointe aux Chevres, K.V.U.Gruppe Lamballe. 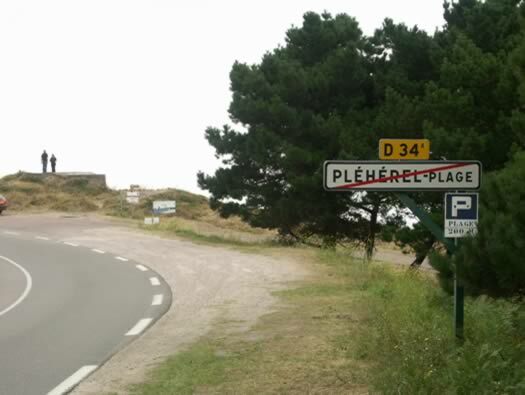 La319 Pleherel pointe aux Chevres. 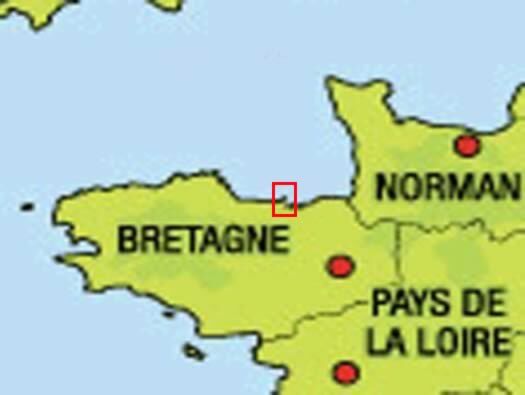 40km west of St Malo is Frehel Pleherel is on the western side of Cape Frehel, 5km back from the lighthouse. 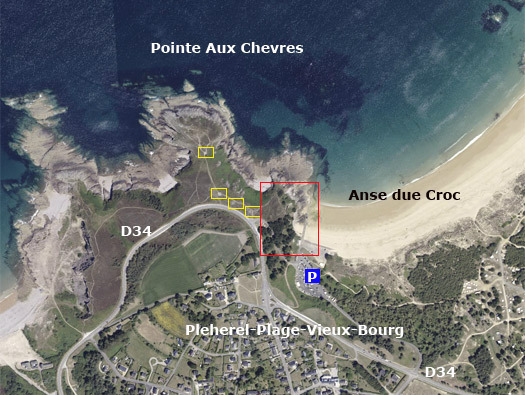 Wn La319 is the small point at the southern end of the plage. 3 x R501 group shelter. 1 x R669 casemate for a 7.5cm F.K. Section La319 Pleherel pointe aux Chevres. 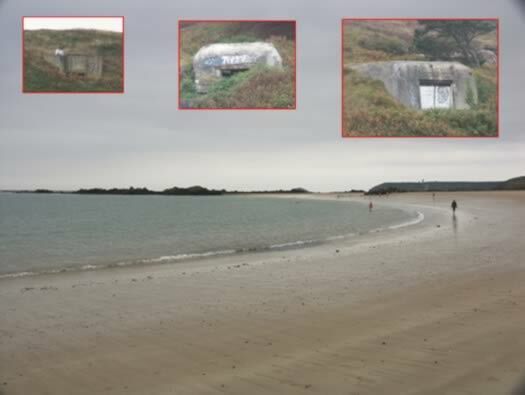 Plan: Yellow are the first bunkers and open emplacements that we found and red the casemates and trenches found. 5cm KwK Pak & ringstand. The road leading away from Cap Frehel and at this corner you can see a small R600b/OB600E type ringstand for a 5cm KwK Pak gun . 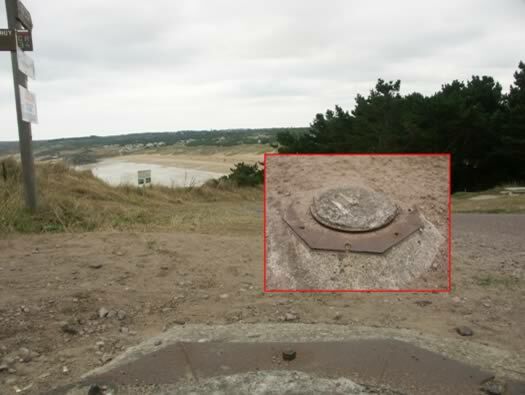 Just in front of the Vf600v is a Renault tank turret Tobruk which looks more like a manhole cover from here. The view from the hill just above the R667. The view in 1918 from a post card. L/R: A concrete building? 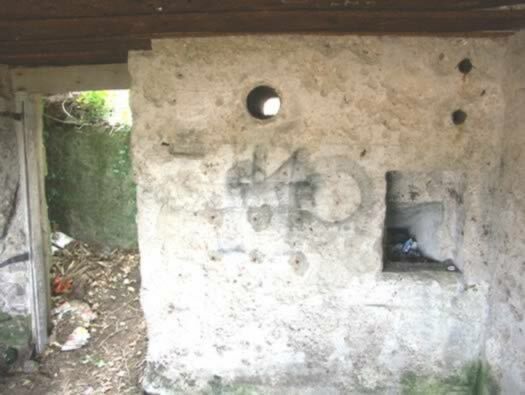 R667 casemate. Trenches & open 5cm Â R600b/OB600E. Renault tank turret. 5cm Â R600b/OB600E. 1 x Vf for personnel. 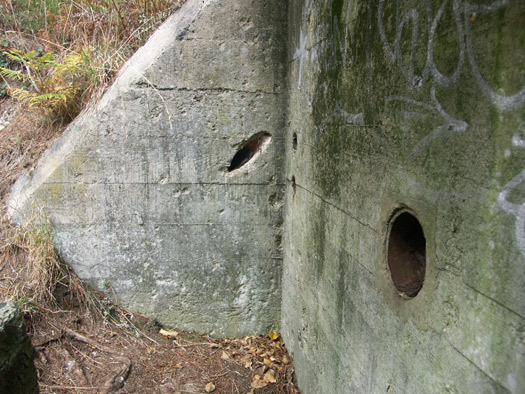 Two R501 group bunkers. R669 7.5cm assault gun. Vf for 5cm KwK casemate. A French WW1 type tank turret set on a concrete bunker for one to two men with ammunition for a machine gun and or a 4.7cm cannon. Vf67 for a Pz.T.F17 Tank Turret. 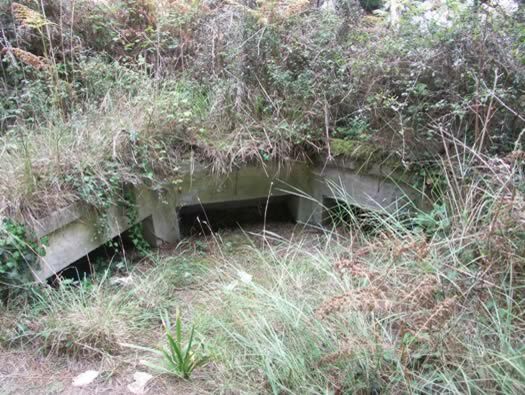 These small self contained Tobrukâ€™s had a rear entrance to a small ammunition magazine, spaces for ready ammunition and then the turret/gun room. Vf67 for a F.T. Tank Turret. R600b/OB600E was an open emplacement for a 5cm KwK Pak gun. Ready ammunition niches all around the wall. R501 Rather Damaged. 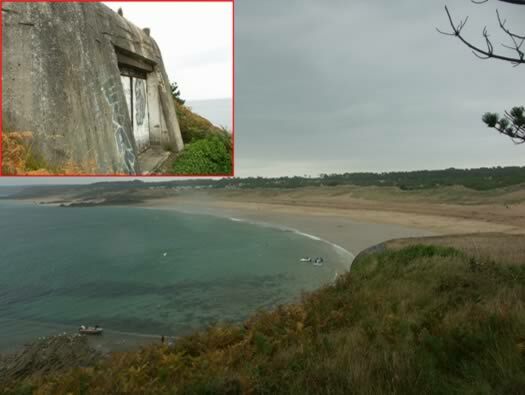 Its a badly damaged bunker probably filled with all the munitions lying around and then blown up. WumpF. 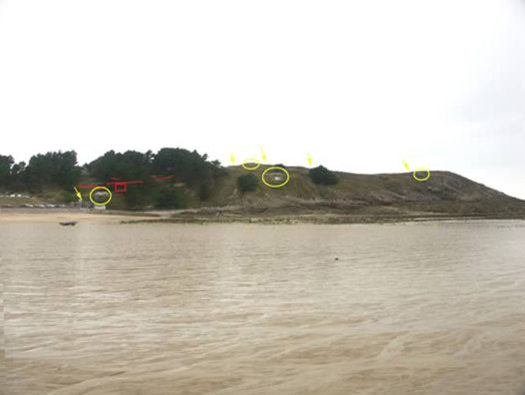 The site if the bunkers, the yellow square are the open emplacements on the hill and the red square the casemate bunkers.. 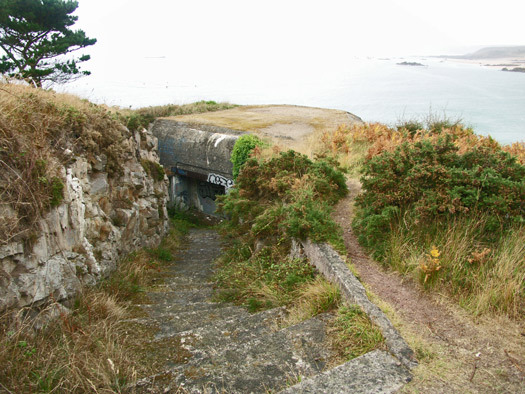 The Second R501 Group Bunker. 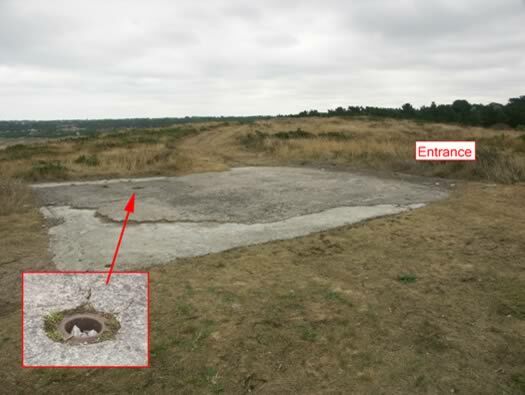 A small group bunker with a periscope hole in its roof. 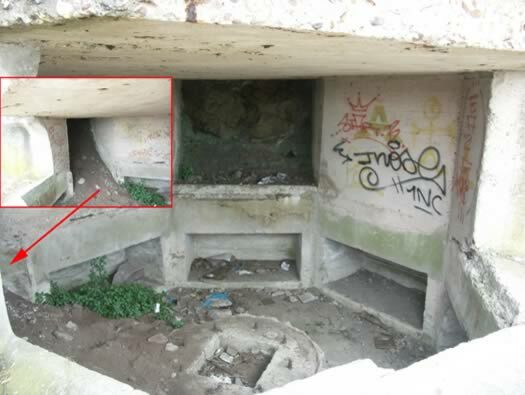 The Third R501 Group Bunker. Photo down the periscope tube. 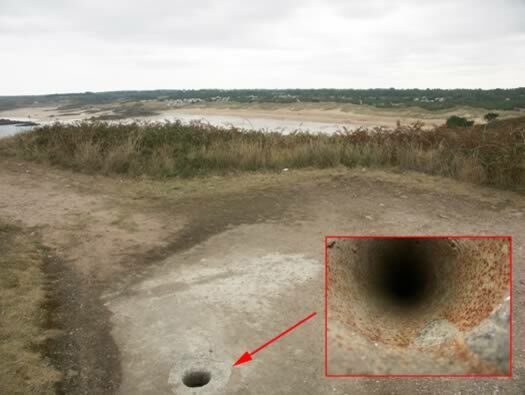 Periscope hole inside a bunker. The remains of an old chapel and inset a photo of what it looked like, I am sure the remains were used as some form of defence for this Wn. The old lady that lived here. 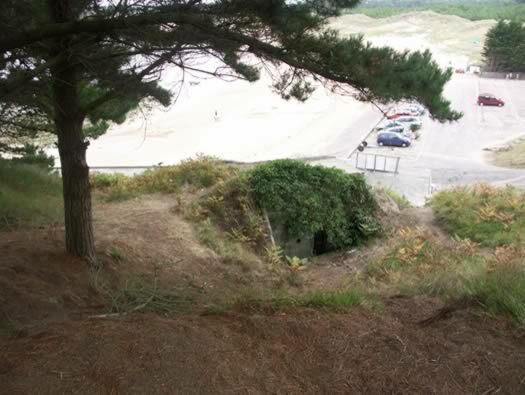 Vf for KwK Gun Casemate. Set just below here is a 5cm Â R600b/OB600E open emplacement and a top has been placed over it to make it into a small Vf casemate. A very expertly made top for this open emplacement, even with a lip at the front to stop water running down the front. 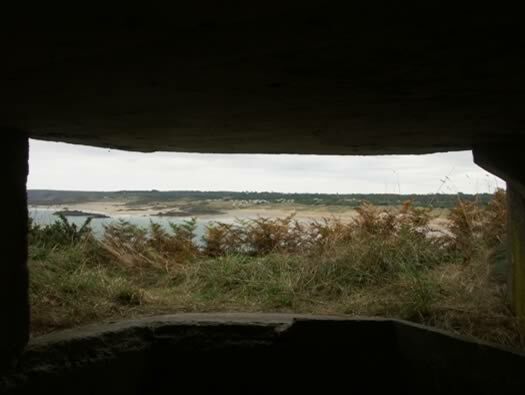 The view inside, the large square hole at the back may have been extra ammunition space? and inset : is the entrance now blocked. There seemed to be no signs of any fighting around this Wn. 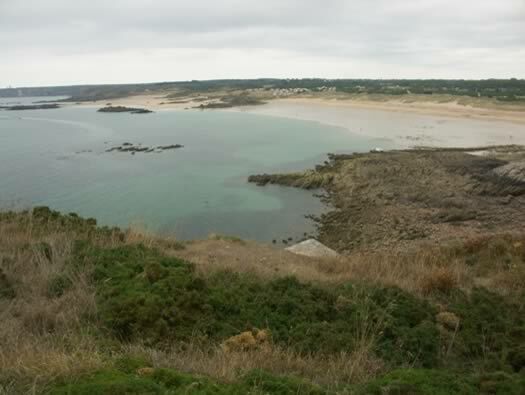 Maybe the US troops in the area captured the centre parts of the peninsular first and made this position unattainable? 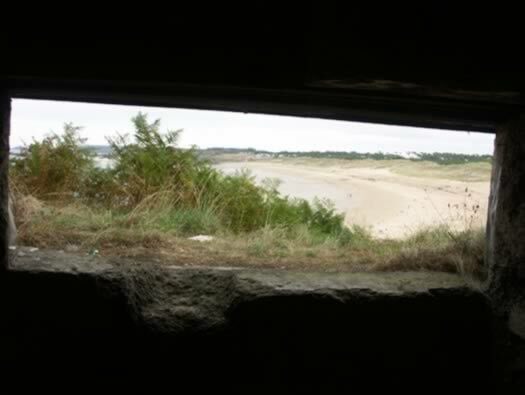 A view from the casemate at the beach. 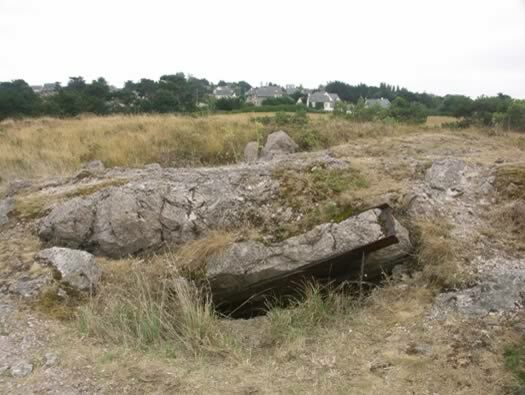 An R669 casemate for a 7.5cm field gun set into the rocky face of this small cliff. 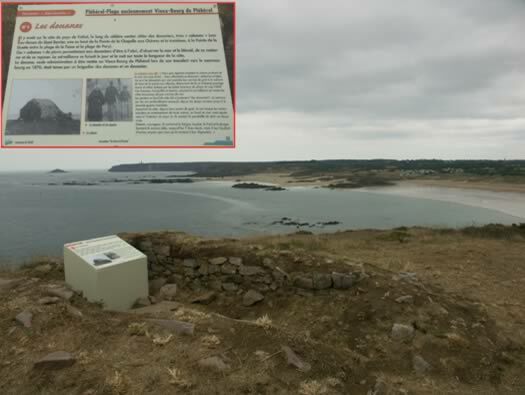 Able to shoot the full length of the beach, this gun would have dominated a seaward approach but as the Americans came from the right rear it made this whole Widerstandsnest superfluous. As I said it has been dug into the rocky face of the cliff and steps down to the rear entrance. Now there are doors fitted to the rear and the front is closed off too. 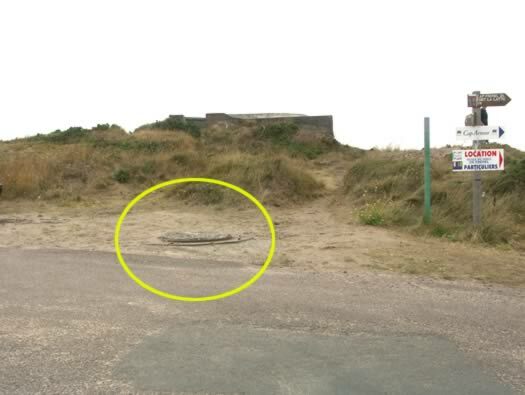 There is a small (French Military) guard post made of thin concrete to the left of the door and the remains of a flag pole base so the area may have been used as a firing range after the war? Very interesting rear entrance to get a 7.5cm field gun down and up. 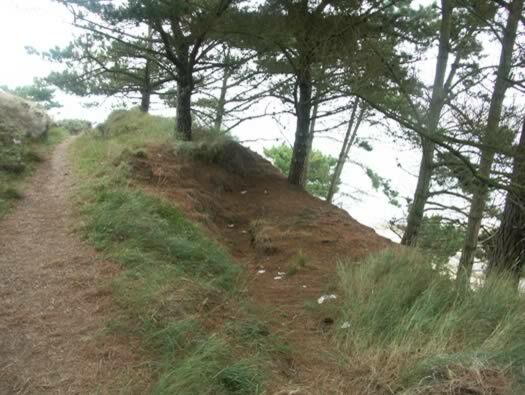 There are many trenches and fox holes dug into the hillside here, some out of solid rock. 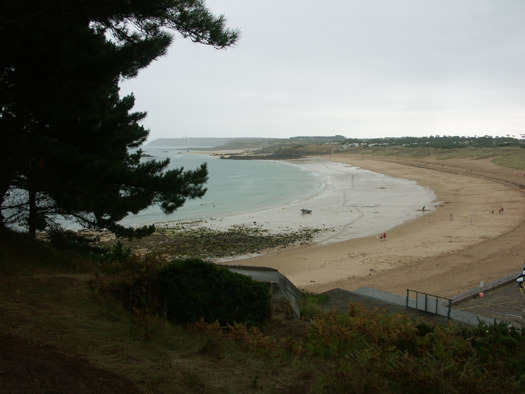 (the area was used as quarries for the pink colour rocks so there would have been no shortage of quarrymen to dig out trenches & gun pits). 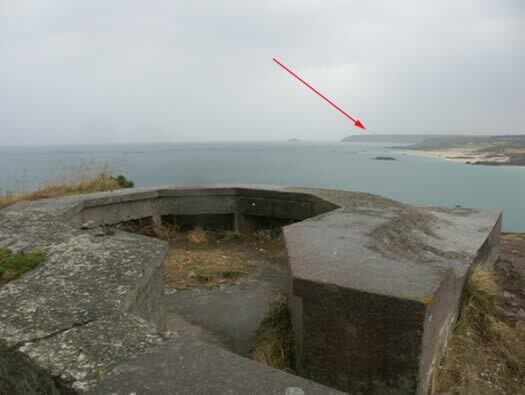 A good infantry position facing the beach with flanking fire and a pathway cut through solid rock to take the 7.5cm gun down to its bunker. 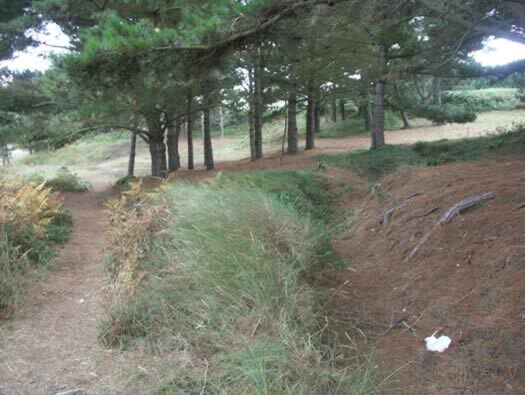 This area is now a toilet for holiday makers BEWARE? 5cm Open Emplacement Â R600b/OB600E. 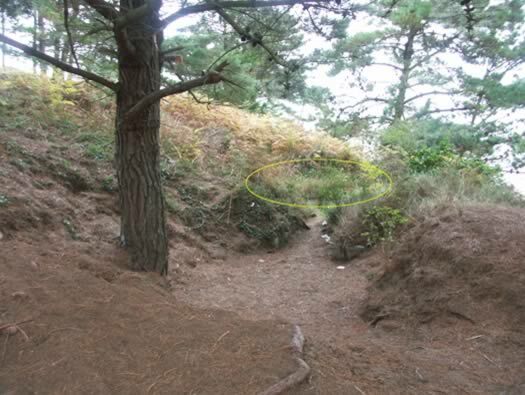 A trench leading into the emplacement. The third Â R600b/OB600E ringstand. 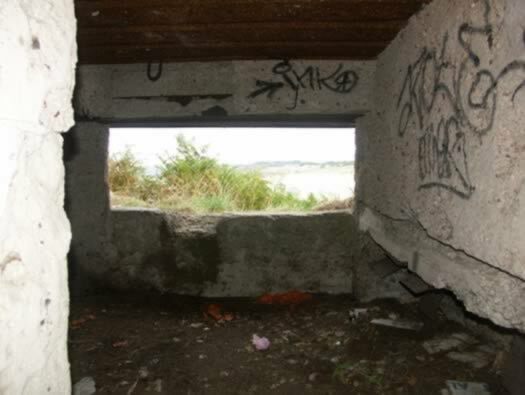 Open Emplacement with a Good View of the Beach. R667 Casemate for a 5cm KwK gun. 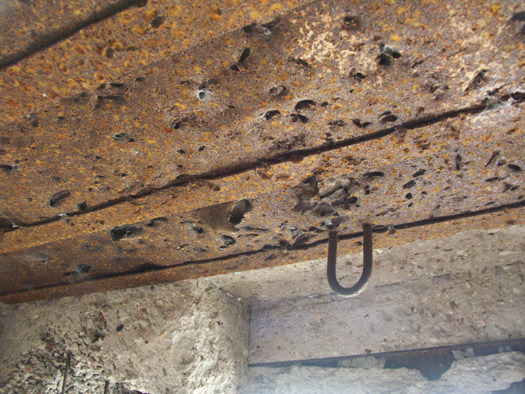 The same gun as in the last open emplacements but now in a full casemate especially designed for this gun. Inside the gun room looking to the rear with the door to the left, a vent pipe to allow foul gases to escape and a shoot to place fired shell cases down to get them out of the gun room and keep the fighting area clear. Now the gun room looking forward with on the right a space for ammunition storage. R667 Casemate for a 5cm KwK gun. There is quite a lot of damage internally. 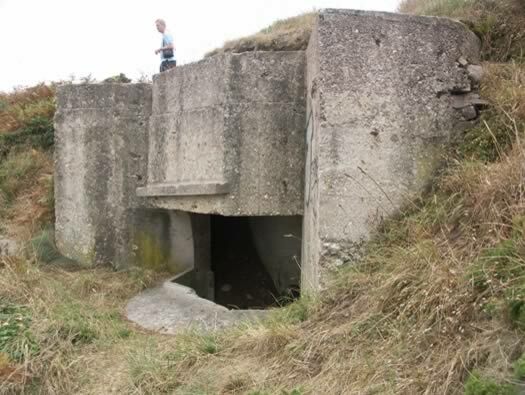 The slit in the sloping wall is where the command wires were fed in to a trench and on to the command post. From the slit to the two small holes into the bunker the wires continued inside to a bunker phone. 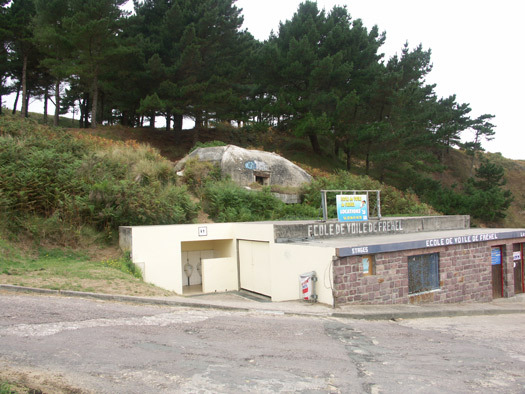 R667 Casemate for a 5cm KwK gun & 'Ecole De Voile'. It just shows how enthusiasm catches you out. I thought this could be an R701 an assault gun garage. It looks like there was only ONE made in the whole of the AOK7 area and this is not the one. Oh well I will keep looking. But it could be??? Vf for KwK - R667 - R669.